The Common is actively managed for wildlife, with a particular emphasis on maintaining and restoring the areas of open heathland, a rare and important habitat once widespread in Norfolk. In the early eighties the late William Foster of Lexham Hall became so concerned about the state of the common that he contacted Norfolk County Council for help. This led to Litcham Common being declared a Local Nature Reserve in 1984 in recognition of its important wildlife and landscape value. A committee, made up of local residents and representatives from Lexham Hall Estate, Litcham Parish Council and Norfolk County Council, was set up to oversee the management of the common. Norfolk County Council funded management work on the common for many years, but this stopped in 2011 as a result of budget cutbacks. 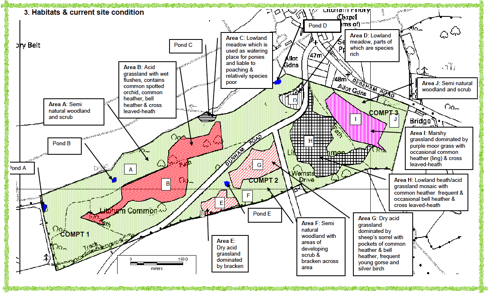 Fortunately, Natural Englandhas agreed to fund the management work on the common for the ten year period from 1 March 2012, under a Higher Level Stewardship Agreement. The main management objective is to increase the area of open heathland and reduce the areas of trees and scrub (particularly birch). However, significant areas of woodland and many of the established trees will be kept so that as wide a variety of wildlife habitats as possible is retained. Four Dartmoor ponies have grazed the western half of the common since June 2008. In September 2012 a project to install cattle grids on the Dunham road was completed, and the ponies are now able to graze the entire site. The ponies’ job is to keep the existing open areas clear of scrub, and maintain a diverse range of plants. In October 2012 a 5 year management plan was completed by the Norfolk Wildlife Trust. This identifies the main areas of trees and scrub to be cleared, as well as other management work to be undertaken. The plan can be viewed here. The importance of the common to local people is also recognised, with the provision of a car park, benches and the regular maintenance of the footpaths. Visitors to the common can enjoy many wild flowers such as heather, devils bit and harebells. Their continued presence bears testimony to the work carried out since 1984. The Management Committee is very grateful to all those who help look after Litcham Common, in particular the volunteers who regularly check the ponies, and the members of Litcham Common Conservation Group who turn out once a month to help with tasks such as scrub clearance and picking up litter. Set up to oversee and implement a management plan when Litcham Common was declared a Local Nature Reserve, under the National Parks and Access to the Countryside Act 1949. The committee meets twice a year, and presents a report to the Annual Parish Meeting (see below for links). Management plan Oct 2012 by the NWT.